Winter is coming fast; even here in Dallas, Texas. While many people do not equate Dallas with cold weather, we that live here know that the winter months can be quite chilly-even cold! We don’t have the extremes that the states north of us do, but we do need a heating system in our homes for the 30-40 degree temperatures of winter. There is nothing more warming to the spirit and the body than the sight and feel of a fire in a fireplace. 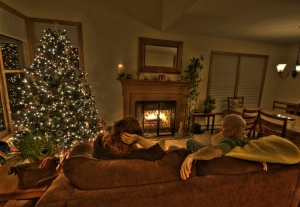 When we think of “hearth and home”, we think of cool nights in front of a warm fire in our own home. In Dallas, the first place to think about getting a fireplace is also the last place you will need to think about, because you will find everything you need here at 1st Choice Chimney. Our mission is simple! Provide honest, friendly, excellent and affordable service that exceeds your expectation and earns your business for a lifetime. Of course, we clean and maintain all types of chimneys, heating and cooling ductwork and dryer vents. But did you know we also install and maintain gas fireplaces? 1st Choice Chimney is committed to bringing you the best in gas fireplace installation and maintenance in the Dallas area. There are many reasons to install a gas fireplace and very few reasons not to. Flip a switch; have fire. That’s the joy of a gas fireplace. You enjoy real flames, but without the hassle and mess of burning wood. There is no firewood to stack and no ashes to clean out. The air inside your house and in your neighborhood stays clean, too. No wonder that about 70% of all hearth products—fireplaces, inserts, and artificial log sets—now burn gas. Today’s gas inserts are heat-producing dynamos that can heat up to 3,000 square feet with just one fireplace. Gas fireplace inserts can be used in all types of fireplaces. They can be built into a new home or an old one and can be vented through the existing chimney (or a wall for a free-standing unit). The units can also be installed in an existing wood burning fireplace. Gas inserts require little maintenance beyond an annual $75 to $125 check-up. There’s a definite green factor — they burn with a 65% to 99% efficiency rating, which means very little pollution or smoke, unlike wood burning fireplaces that produce hazardous air pollutants (HAPs). HAPs are an important component of wood smoke. A group of HAPs known as polycyclic organic matter includes benzo(a)pyrene, which may cause cancer. Particle pollution in smoke can damage lung tissue and lead to serious respiratory problems when breathed in high concentrations. In low concentrations, particle pollution in wood smoke can harm the health of children, the elderly, and those with existing respiratory diseases.